Standing among this Spring’s candidates for graduation, Robert Parham Jr. will deliver on a promise he made to himself and his mother more than 40 years ago. 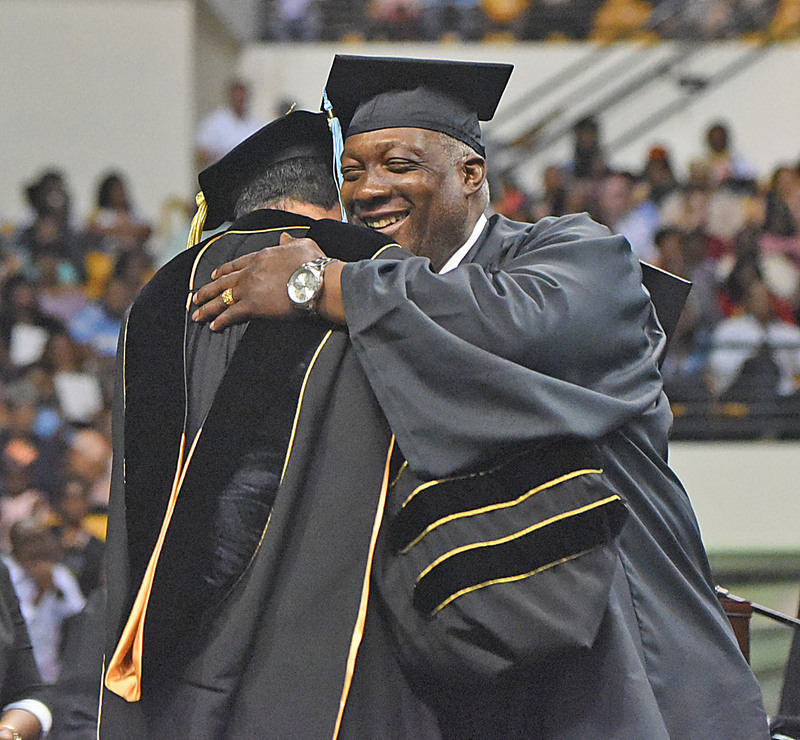 For Parham, the Grambling State University on Friday, May 11 is more than just a walk across the stage. The Kinesiology major will enter the Frederick C. Hobdy Center to fulfill a decades-old dream. A native of Atlanta, Georgia, Parham is best known to most for his three decades of football achievement. In 1981 he was selected and played for the San Diego Chargers of The National Football League for two years and was a free agent with the New Orleans Saints in 1983 -1984. As Grambling State University’s leading rusher from 1978-80, he amassed 2,700 yards over that span as GSU won three consecutive SWAC titles. He was three times named Black College All-American, three times named to the All-SWAC first team and in 1980; he was named Black College Player of the Year. He was also awarded the Jake Gaither Award and broke the rushing record of Paul “Tank” Younger having gained 3,448 yards. While an unconventional path, these achievements paved the way for Parham to become a GSU Legend, which helped him ultimately fulfill his graduation dream. Those mentors and coaches include The Legendary Coach Eddie G. Robinson and Coach Melvin Lee, both from Grambling State. Parham a first-time All-Conference running back in each of the three seasons he played for Grambling. He graduated from Gordon High School in Decatur, Georgia where he was also a two-time All-State and a three-time All-DeKalb County first-team fullback and linebacker. Parham has spent most of his adult life helping his community, family, and friends advance by providing. Known to most as a “gentle giant” he has broken records on and off the field using his love for sports as a tool to help build his career as a man whose word is his bond. “From the moment that Robert reached out to the Department of Kinesiology, Sport & Leisure Studies (KSLS), it was apparent in his tone of voice of how important completing his undergraduate degree was to him. He has been persistent in communicating with the KSLS advisors on a degree completion plan based on his prior academic work,” said Dr. Obadiah Simmons Jr., department head. During the past 20 years, Parham has worked in law enforcement as a Deputy Sheriff of the Fulton County Sheriff’s Department; The Fulton County Police Department Jail Division; and as a Police Officer with the State of Georgia Building Authority Police Department, Atlanta, Georgia. Earlier in his career, Parham also served as an Off-Shore Drill Serviceman with the Shell Oil Company in New Iberia, Louisiana. He is the proud father of one son, Kellen Parham (Ashley) of San Antonio, Texas and two granddaughters Kennedi and Kailen. Congratulations Robert Parham on fulfilling your graduation dream. This entry was posted in gramstory on May 11, 2018 by Jovan Hackley.